The Bismarck Tribune's liveblog of the trial of John Unruh. Unruh has pleaded not guilty to Class AA felony murder and Class C felony preventing arrest. It is not normal for a jury to explain why they found the verdict they did. If you read the entire blog you can get a good picture of why they went the way they did. thank you for all your hard work Nick and Jenny! thanks Nick & Jenny for the amazing job you did covering the trial & giving us the opportunity to have a first-hand live account of what was happening. I am looking forward to more of your work. You guys make a great team! Congrats. Job well done!! Tribune photographer Tom Stromme took this photo of John Unruh and his mother leaving the Burleigh County Courthouse this afternoon. 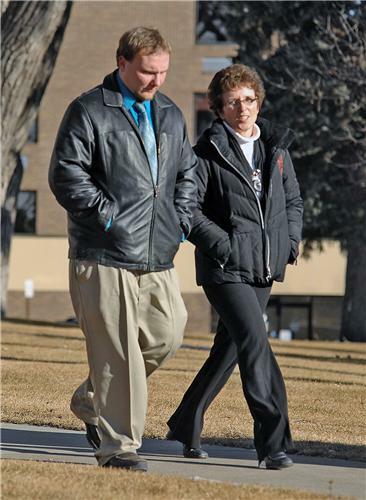 Unruh was acquitted of all charges related to the April 2011 stabbing death of Randall Albaugh. @BOB: I believe most of your posts are making it up. Did I miss one? Has Unruh been free during this whole process? you guys did a great job during the trial. But that Target comment should not be on here. Thats pathetic. Did the jury have the option of finding him guilty on lesser charges? @motherofthree remember if there's any doubt then it's a not guilty verdict. they couldve had doubt that he intended to kill his friend. I am glad it turned out this way. Was there any information presented as to why they reached the verdict that they did? How did the Albaugh family seem to take the verdict when it was read? what was the reaction of the courtroom? time to start armchair quarterbacking-why did the AG's Office not try the case? Assuming there will now be a wrongful death suit filed by the Albaugh family. Is there any chance that Unruh could be tried again? Or is it completely over for him? This is just a random thought, but can Unruh counter with charges in a case like this?